Cufflink by the Maltese Cross Maker, circa 1900. In an earlier post (April 30. 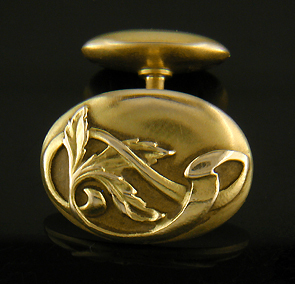 2011) I discussed an unattributed group of cufflinks created in the flowing Art Nouveau style of the early 1900s. The cufflinks were created by an unidentified maker which I provisionally named the "Maltese Cross Maker." The name reflected the unusual signature mark of the maker - a Maltese cross in a circular recess stamped on the reverse of the cufflinks. Several readers suggested that this mark resembled the maker's mark of H. A. Kirby, a jewelry manufacturer based in Providence, Rhode Island. The suggestion was a good one, H. A. Kirby was likely the mystery maker. Since then I have been on the look out for documentary evidence - period catalogs, advertisements in trade journals, news articles - that would confirm H. A. Kirby as a maker of fine cufflinks. On a recent Spring evening I came across the following article in the August 30, 1899 edition of The Jewelers' Circular and Horological Review, a trade journal serving the retail and wholesale jewelry industry. I like to think of the events described as "The Great Cufflink Caper." One of the interesting aspects of the article is that the average value of the stolen cufflinks was $20.00 to $25.00. These were truly expensive cufflinks for the period. H.A. Kirby Diamond-set Cufflink, circa 1900. The robbery of a large number of diamond cuff buttons, which occurred about July 27, became generally known Monday through a sensational article in a New York newspaper. The story was based on the arrest of Harry Pye, who gave his address as 94 King St., New York, and whose incarceration and indictment have been kept secret up to this time. Pye was arrested by Central Office Detectives Boyle and Carpenters, who are detailed to cover the pawn shops of the city, while in the act of pawning a number of cuff buttons. He was taken into custody, and besides a number of buttons, 25 pawn tickets, all calling for similar articles, were found upon his person. Pye, the detectives learned, was a brother of Willie Pye, a young man employed occasionally in the New York office of the H. A. Kirby Co., 9-13 Maiden Lane. Willie Pye's business was to help the firm's New York representative, Archibald Rutherford, to get ready his samples and to carry the cases. On July 27 about 100 pairs of cuff buttons were supposed to have been put into one of Mr. Rutherford's cases, but upon his arrival in Boston he found that they were not there. Inquiry at the New York office disclosed the fact that they had been taken from the stock, and the case was put into the hands of the detectives the same day that Harry Pye was arrested. While it is believed beyond a doubt that the articles were stolen by Willie Pye and turned over to his brother to pawn, the arrested man would, however, give no information as to his accomplice or accomplices. At the office of the H. A. Kirby Co. Monday, it was stated that Willie Pye had not, up to that time, been arrested. The value of the goods, it is stated is between $2,000 and $2,500. Exuberant Sunflower Cufflinks by H.A. Kirby, circa 1900. In a follow-up note the eponymous founder of H.A. Kirby Co. was reticent about discussing the theft. Providence, R.I. Aug. 28 - H.A. Kirby, of the H.A. Kirby Co., was seen in reference to the report in the New York Herald, but would not talk on the subject. 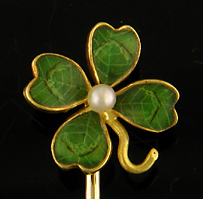 Kirby Clover Leaf Stickpin, circa 1900. Recent additions to the Antique Jewelry Galleries include intriguing bloodstone cufflinks from Sansbury and Nellis and a winged-scarab stickpin by Hans Brassler, Jazz Age lapis lazuli and gold cufflinks, Art Nouveau foliate scroll cufflinks, and elegant sapphire and diamond cufflinks with intricately engraved platinum tops. Heliotrope Heliotrope is a beautiful gemstone with the mesmerizing appearance of fiery embers smoldering in a dark ashes. These elegant cufflinks were created by Sansbury & Nellis during the Art Deco era. 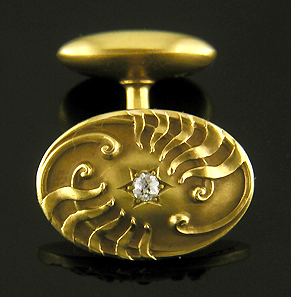 Crafted in 14kt gold, circa 1920. Scarab and Bloodstone A wonderful interpretation of a winged scarab by Hans Brassler. In this imaginative jewel, the jeweler combined elements of Art Nouveau, Gothic Revival and Arts & Crafts design while evoking the mysteries of ancient Egypt. Crafted in 14kt gold, circa 1910. Lapis and Gold The rich blue of lapis lazuli accented with small bits of fools gold beautifully captures the elegant, raucous spirit of the Jazz Age. Crafted in 14kt gold, circa 1925. Feathery Scrolls Art Nouveau flowing, feathery scrolls. The flowing design of these cufflinks may have been inspired by crashing waves along a rocky shore or ferns unfurling in the early Spring. 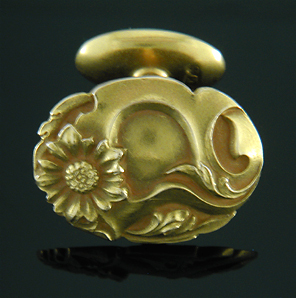 Created by Link & Angell in 14kt gold, circa 1900. Sapphire and Diamonds Beautifully engraved cufflinks set with rich blue sapphires and sparkling white diamonds. The hexagonal borders feature intricate geometric designs in the Art Deco fashion. Crafted in platinum and 14kt gold, circa 1920.